More and more across Canada and North America, astronomy club members are being joined coast to coast by families, environmentalists, business leaders, marketing experts and more. For years, local astronomy club members and observatory owners have pushed for the municipality, ferry operator, and Parks Canada to make a good thing even better and go beyond a responsible lighting plan to encourage landowners and business operators to go dark. When I visited the area and met some of the personalities responsible for astronomy outreach in the Bruce Peninsula this past summer, the overwhealming consensus was that critical mass after 11 years of work by amateur astronomers such as Doug and Paula Cunningham and Rod Steinacher was reached when such stalwart stargazing crusaders teamed up with the business, marketing and communications talents needed to effectively discuss change with local stakeholders. Among other wins, this collaboration between longtime astronomy buffs and interested newcomers with skills to share has resulted in grants for light pollution audits and lighting replacement programs, as well as funds to develop a boardwalk with telescopes that will be mounted there for the enjoyment of groups and the general public. 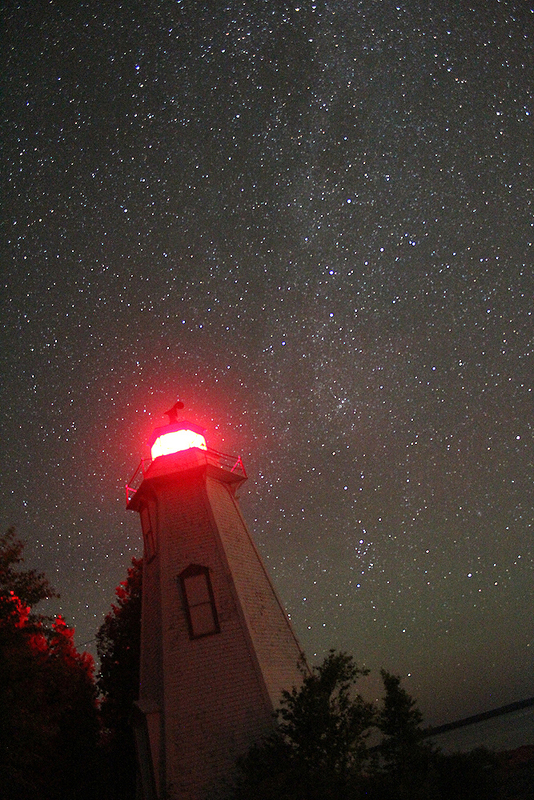 After the initial dark sky community – and later dark sky preserve – designation for the Bruce, Elizabeth, along with Rod and others, has also been a key communicator in convincing the Owen Sound Transportation authority (which operates the ferry between the peninsula and Manitoulin Island and associated docks) to dim and replace much of their polluting lighting at the ferry docks in Tobermory. As local observatory owners such as Doug and Paula and telescope-weilding landowners such as Rod suggest, this truly sets the stage for Bruce Peninsula becoming known as one of North America’s true crown jewels – not just for its world-renowned diving, shipwrecks, lush biosphere, and gorgeous sunsets – but also for the down-to-the-horizon starscapes that families and groups of all ages can enjoy above it all. Come this summer, and those that follow, I can’t wait to see an updated set of sky quality metre readings and light pollution maps taken after this change – scheduled for before the 2012 tourist season – takes effect, as well as some changes Parks Canada and local businesses are implementing on the Peninsula to make the skies above the Bruce truly world-class. I am planning to observe it from somewhere along that shore.